Friday's Performance will have General Admission seating available at the door. If there are no remaining seats online, there will still be limited seating available for walk-up purchase. Center Theatre Players Christmas Memories is fast becoming one of the area’s most enjoyable holiday traditions. Back for a second year, Christmas Memories II is sure to delight the entire family! If you're in a 'bah, humbug' mood this holiday season, Christmas Memories may be just the remedy. With all the holiday classics like " "The Christmas Song," "Christmas Memories," "Winter Wonderland," "Silver Bells" and "Jingle Bell Rock", Christmas favorites from your childhood will bring back memories and create new ones too. 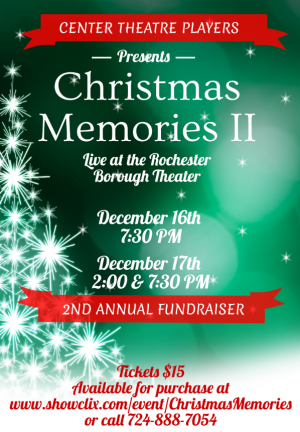 Celebrate the Christmas season with this heartwarming variety show featuring an unbelievably talented cast from Beaver, Lawrence, and Allegheny counties. It is an entertaining and heartwarming theatrical work that is just perfect for the holidays. Let’s make some new Christmas Memories together!